The 2017 Nissan Armada has been completely redesigned to bring an intense new look wherever the roads take you. Every component on the 2017 Armada has been given an uplift that cannot help but be noticed. The roof rails on the 2017 Armada have available crossbars that make hauling surfboards, bikes, kayaks, and anything else your adventure calls for easier than ever before. Available on the 2017 Armada are 20-inch wheels that making getting to your favorite hiking areas quick and easy even when you have to travel off the beaten path. The 2017 Armada has also been given LED headlights and taillights to ensure that you’re always seen no matter what time you’re out driving. Let’s take a look at some of the other design features of the 2017 Nissan Armada. 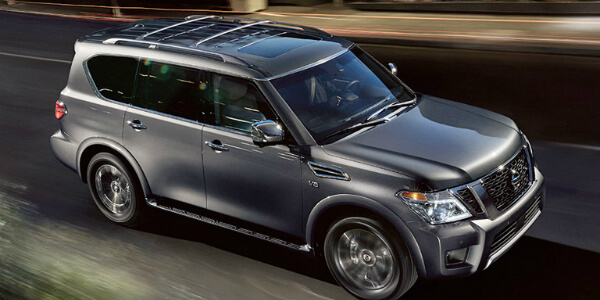 The 2017 Nissan Armada is capable of seating up to eight passengers, and still has enough room for everyone’s luggage without compromising on any legroom. 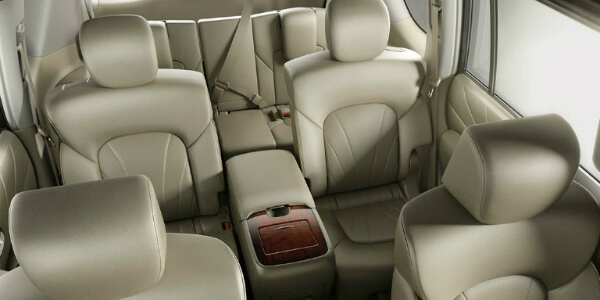 Every seat inside of the Armada is the best seat in the house thanks to the beautiful leather-appointed seats that are available. Also available inside the Armada are second row captain’s chairs that bring a new level of sophistication to the seats in back. Available on the back of the front seats are two mobile entertainment centers that allow the passengers in back to enjoy their favorite movies or play their favorite video games. When used with wireless headphones, everybody in the front and back of the 2017 Armada will be able to listen to their favorites without bothering the other passengers. Chrome air vents on the sides of the 2017 Armada add both style and functionality to give the Armada an even more distinct look. The 2017 Armada also features a new, muscular grille that sets the Armada apart from every other vehicle from the front to the back. Clean lines and an aggressive look let everyone know that you’re on your way to the next adventure. The 2017 Nissan Armada is available in seven vivid exterior colors that range from Pure White, to Hermosa Blue with everything in between. These color options mean that finding an Armada to perfectly blend with your personal and unique style has never been easier. With its revamped exterior and interior design, you’ll have no problems standing out from the crowd in your new 2017 Nissan Armada. If you’re interested in taking a look at some of the features that come standard and are available on the Armada, feel free to mosey on over to our dealership here in Palmdale where you can see all of the great features of the 2017 Armada for yourself. If learning about the upgraded design has already got you itching to get behind the wheel, you can schedule a test drive right from our website. Choose the day that works best with your schedule, and we’ll have the keys ready and waiting for you!